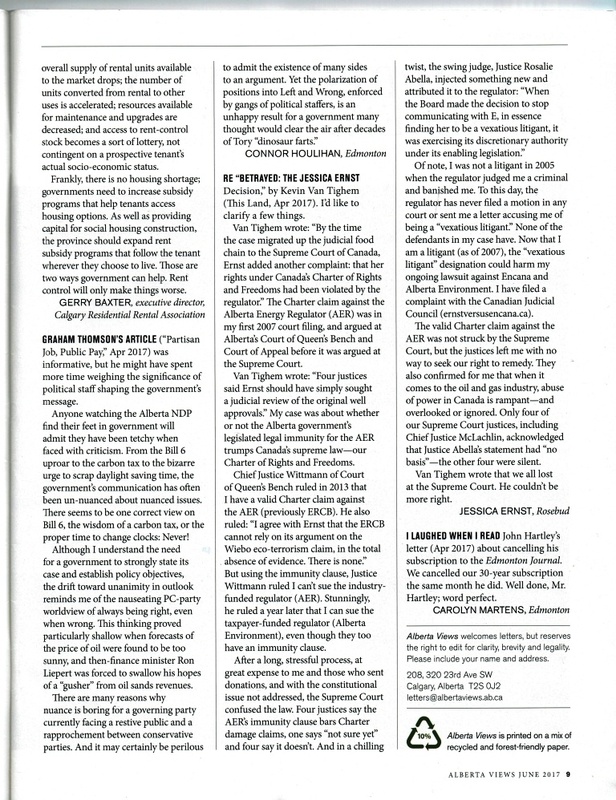 Subject: Clarifications to Kevin Van Tighem’s “Betrayed, The Jessica Ernst Decision,” Alberta Views April 2017. 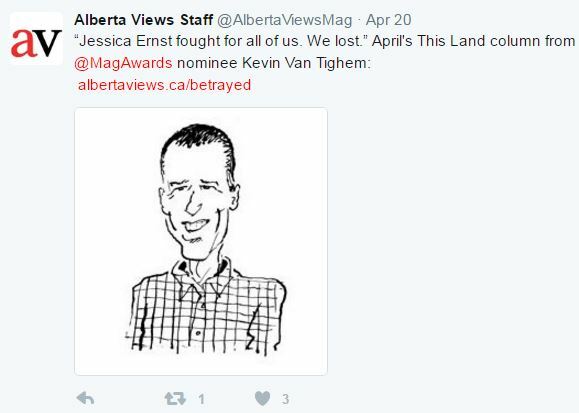 Re: Clarifications to Kevin Van Tighem’s “Betrayed, The Jessica Ernst Decision,” Alberta Views April 2017. Thank you for the support. I’d like to clarify a few things. Chief Justice Wittmann of Court of Queen’s bench ruled in 2013 that I have a valid Charter claim against the AER (previously ERCB). He also ruled: “I agree with Ernst that the ERCB cannot rely on its argument on the Weibo eco-terrorism claim, in the total absence of evidence. There is none.” But using the immunity clause, and to prevent citizens from seeking justice for Charter violations “dressed up in their Charter clothes,” Justice Wittmann ruled I can’t sue the industry-funded regulator (AER). Stunningly, he ruled a year later that I can sue the taxpayer-funded regulator (Alberta Environment), even though they too have an immunity clause. The valid Charter claim against the AER was not struck by the Supreme Court, but the justices left me with no way to seek our right to remedy. They also confirmed for me that when it comes to the oil and gas industry, abuse of power in Canada is rampant – and overlooked or ignored. Only four of our Supreme Court justices, including Chief Justice McLachlin, acknowledged that Justice Abella’s statement had “no basis” – the other four were silent. Mr. Van Tighem wrote that we all lost at the Supreme Court. He couldn’t be more right. One final point of interest to those who follow the Supreme Court’s practice and procedure – in this case the Chief Justice on motion stated a constitutional question for the appeal which in the end she herself declined to answer in dissent, as did Justice Abella for other reasons, leaving only 4 of 9 members of the Court providing an answer. Effective January 1, 2017, the Amended Rules have dispensed with the former Rule 60 motions to state constitutional questions. Instead, under new Rule 33, parties are expected to identify and frame their own constitutional question at the leave and appeal stages. This new procedure is bound to require more scrutiny by Attorneys General looking to decide whether to intervene in a constitutional question that the Court itself has not yet defined. 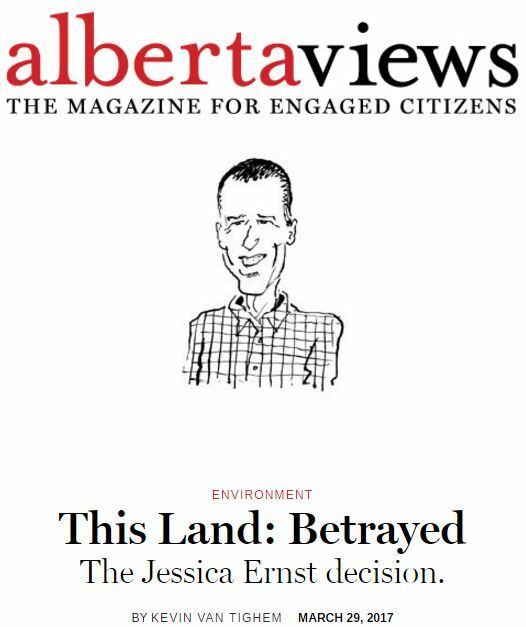 This Land: Betrayed, The Jessica Ernst decision by Kevin Van Tighem, March 29, 2017, in Alberta Views April print issue. That statement was a complete and almost certainly deliberate misrepresentation of the legal decision. The Supreme Court actually chose to be silent on Ms. Ernst’s Charter rights and never addressed the question of negligence. If ordinary citizens were the audience for that media release, the AER’s gloating and post-truthy response makes no sense. But we weren’t the audience. Where the AER is concerned, it was never about us. The AER is staffed by oil-industry insiders and entirely funded by oil and gas revenues. They know who butters their bread. Given the real audience for that media release, it wasn’t tone-deaf at all; it was meant to reassure. Jessica Ernst may have lost her legal battle, but she got the AER to prove that it is—as has long been argued by its critics—a captive agency almost fully in the service of the very industry it’s supposed to regulate. In the early 1990s the AER’s predecessor, the Energy Resources Conservation Board, approved a number of coalbed methane wells around Ernst’s home near Rosebud. Encana, which drilled the wells, used fracking to release methane from shallow coal seams. Water wells in the area promptly began to go sour. Ernst’s was among them. Her taps began to spew foam. The bubbles were natural gas. She couldn’t drink the water anymore—but she could light it on fire. When a gas or oil company contaminates groundwater in Alberta, they usually cut private deals to make the problem disappear. In exchange for cash, a new water well or a commitment for trucking potable water in from far away, the landowner signs a non-disclosure agreement with the company. With no public record of the transaction, the industry and its regulator continue blithely to assure us that no evidence exists of oil and gas drilling poisoning our groundwater. Ernst, however, wouldn’t play the cover-up game. She refused to sign a non-disclosure agreement. She refused to be bullied by threats from lawyers. She kept asking awkward questions. She simply refused to behave like a nice, tame Albertan properly subservient to Big Oil. She’s an Albertan who had the gall to stand up for her rights. The court’s majority ruling dodged the question of whether the AER abused its powers. Finally the agency simply slammed the door on her. For months, Ernst was denied all access to a public agency set up to address public concerns. So she sued them. The AER insisted they can’t be sued, because their enabling legislation grants them immunity. By the time the case migrated up the judicial food chain to the Supreme Court of Canada, Ernst added another complaint: that her rights under Canada’s Charter of Rights and Freedoms had been violated by the regulator. January’s decision was a close split. Four justices said Ernst should have simply sought a judicial review of the original well approvals. Another rejected her case because, in his view, the Charter rights question had been added too late and should have been considered by lower courts first. Combined, the five were a majority; they dismissed Ernst’s case on technicalities without looking at the evidence. Chief Justice Beverley McLachlin and three other justices, however, found in support of Ernst. The dissenting justices pointed out that while the AER might be immune from liability for regulatory decisions “…there is nothing in the record which indicates that the board was acting in an adjudicative capacity in this case… here, the impugned conduct is said to have been punitive in nature.” Exactly. 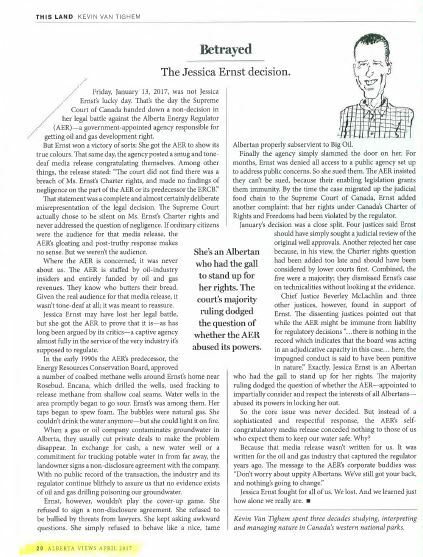 Jessica Ernst is an Albertan who had the gall to stand up for her rights. 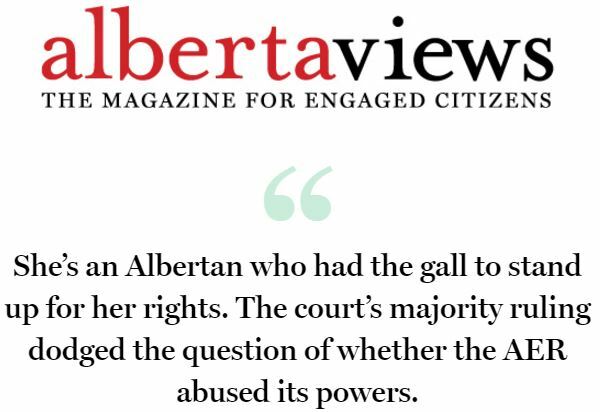 The majority ruling dodged the question of whether the AER—appointed to impartially consider and respect the interests of all Albertans—abused its powers in locking her out. So the core issue was never decided. But instead of a sophisticated and respectful response, the AER’s self-congratulatory media release conceded nothing to those of us who expect them to keep our water safe. Why? Kevin Van Tighem spent three decades studying, interpreting and managing nature in Canada’s western national parks.